Send us your patient contact data . . . 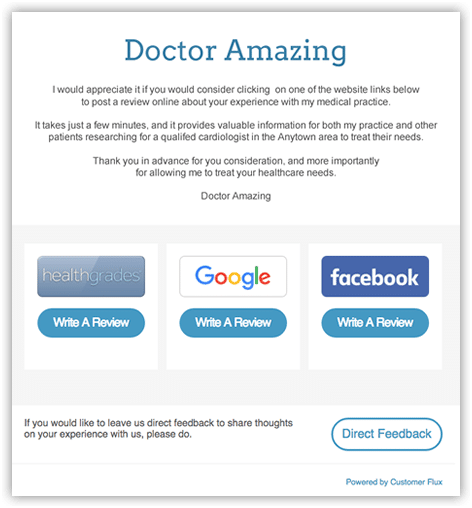 Your practice now has a team of experts using a robust platform to gather patient feedback, measure your Net Promoter Score, encourage online reviews, display testimonials on your website and help you interpret & navigate the positive and sometimes even the not so happy patient feedback. The consistency of your medical practice Name, Address, Phone and Website (NAP+W) helps patients and search engines find you online. We submit your business data to the major aggregators, top directories and review websites. • Optimize profiles with photos, insurance providers, education, specialties, etc. Don’t let bad data hurt your local online visibility. Data consistency is a top local search engine ranking factor. Google trusts businesses with consistent NAP+W data… resulting in a better opportunity for patients to find you. The Customer Flux team and Platform do the rest! The patient is asked via email or text how likely they are to recommend the practice to a friend or colleague? 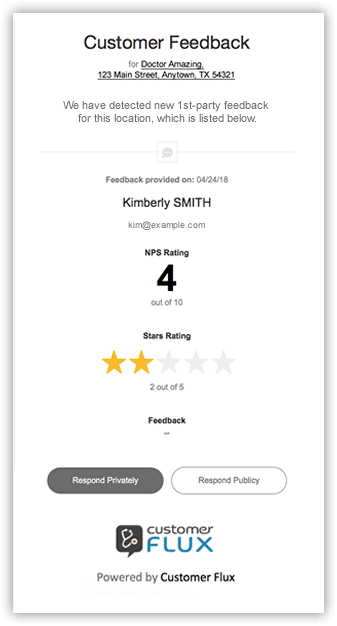 This rating process helps form your Net Promoter Score (NPS) – a key indicator of the level of satisfaction your patients have with your practice. Studies show there is a direct correlation between the number of online reviews and the NPS rating. The higher the rating… the more reviews your patients will create when asked. Patients will submit powerful testimonials directly to you through the Customer Flux platform. With our review widget, you will be able to show these on your website and get star ratings from Google. 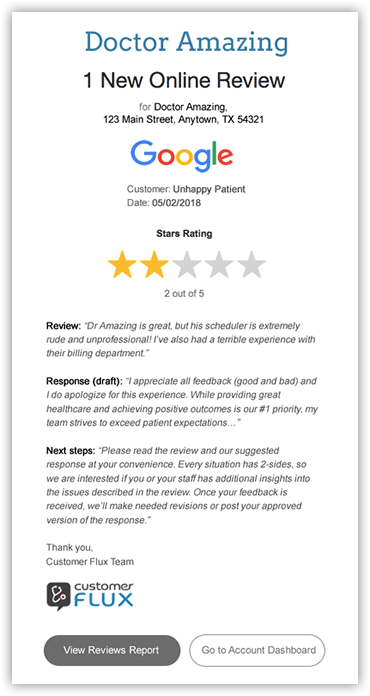 *We follow Google’s TOS on reviews and unhappy patients are presented with the opportunity to create a review with our platform. Patients are asked to submit an online review after giving the practice a positive NPS rating or directly if NPS is not used. Our team will ensure that the review requests sent to your patients are spread across the top review websites for your medical specialty in the city the practice is located in. Having more reviews on the top websites helps to distinguish the HCP from competitors and limits exposure should a negative comment occur. Using a consistent long-term process to solicit patient feedback will generate testimonials, online reviews and improve the SEO visibility for the HCP. In a 2017 study**, 77% of consumers expressed that reviews older than 3 months are not relevant. Using a process that consistently asks for new online reviews circumvents this issue, increases relevancy and separates the HCP from competitors. We don’t want to overcommunicate marketing messages to your patients, so our software will only send one request during a designated number of days (e.g. 60, 90, 120, etc). Embed our testimonial widget anywhere on your website to display positive 1st and 3rd party testimonials. Copy and paste a few lines of code and your widget is up and running. It’s mobile-friendly and has display options. We can tag testimonials that describe important services offered by the HCP and create separate widgets if desired. For example, a GI doctor might want a widget that just shows testimonials describing positive experiences with colonoscopy procedures to display on a colonoscopy or colon cancer screening page. By using schema code, your 1st party testimonials can generate star ratings in Google for your website. Our widget automatically creates this schema code for you. While any business would only like to receive positive customer feedback, that scenario is not realistic. The good news is consumers know this and expect to see a mix of positive and negative reviews. Unfortunately, negative comments are especially difficult for HCP’s, since HIPAA greatly limits how they can publicly respond and defend their practice. Customer Flux customer, Dr. Kenneth Brown, describes how managing his online reputation has changed his practice. Specifically he addresses the importance of negative reviews and how they can be challenging to deal with, but that it is critical to respond to the negative commentary. With Customer Flux you stay current on new reviews and patient feedback activity with our email alerts. 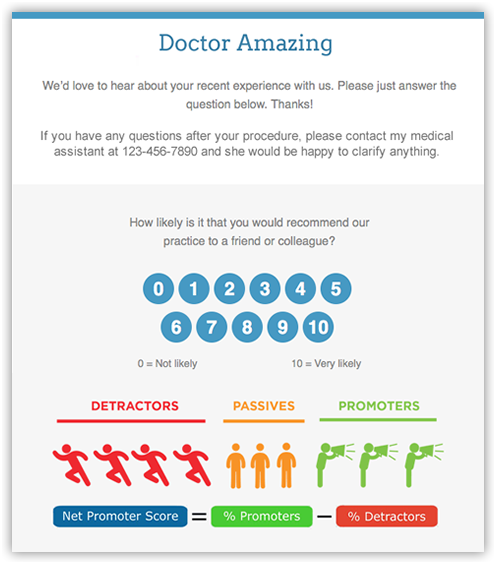 Our reporting offers overviews and insights into your Net Promoter Score, direct patient feedback and online reviews. 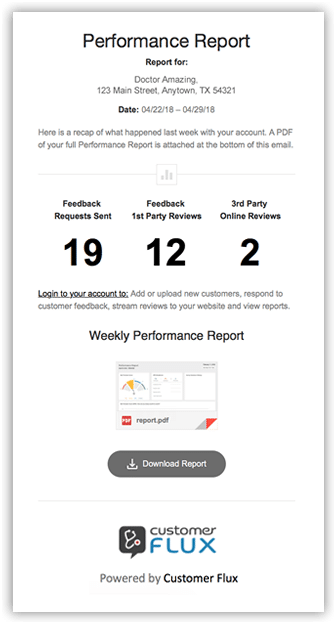 Customer Flux is much more than a robust reputation management platform. 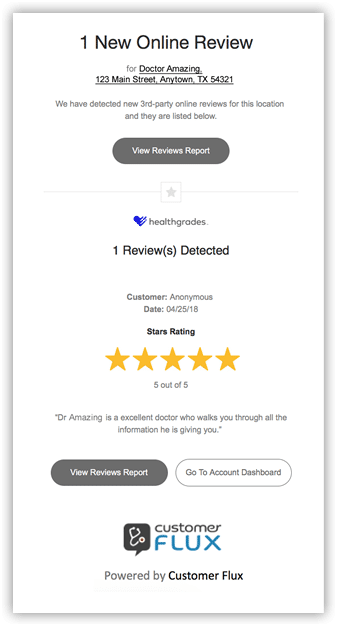 We analyze each client’s results and provide recommendations to help improve their overall online reputation, quantity of reviews, create HIPAA compliant review responses and share best practice advice. Let’s start turning your positive patient feedback into a powerful marketing message and NEW PATIENTS!